The Riyria Revelations series is one of the great success stories of self-publishing. 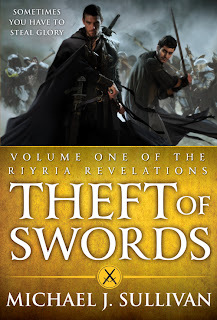 Now Michael Sullivan has been picked up by Orbit, and I’ve finally read Theft of Swords (no connection! ), I can only say that Michael Sullivan absolutely deserved it. Theft of Swords, the omnibus of The Crown Conspiracy and Avempartha, is one of the best traditional fantasies I’ve ever read. Royce and Hadrian are thieves – hired by the nobility for their skills at espionage and theft (the evident). Hired for a seemingly innocuous – well, more innocuous than usual – errand, they’re rapidly blamed for the murder of the monarch. With a conspiracy of unknown origin, magic, and not a little intrigue playing into the mix, they’re forced (don’t ask, I won’t tell) to kidnap the current king. And after that… Well, that would be telling. Let’s just say there’s enough deviousness to keep everyone happy – and some truly amazing moments with dwarves. Believe me, those don’t happen often enough for anybody. The main strength of this novel is, however, the symbiosis of plot and character. Royce, Hadrian, and their charge are believably larger than life (as we expect), likeable, and amusing – which makes them the perfect match for the plot, which provides them with the situations to showcase this. Perfectly. I’m a sucker for a good pair of protagonists (and some decent banter), and Royce and Hadrian are perfect in this role. There really are too few very competent protagonists – those at the top of their trades. This book will let you know why. The ending – and sequel – don’t disappoint either. Although it’s never going to be profound, this has some incredible sequences, some wonderful moments and more than just ‘some’ incredible characters. Theft of Swords is a masterpiece of traditional fantasy that you really need to read. Thanks for the review! This book sounds really interesting! The kidnapping monarchy part sounds kind of old school, but at the same time, interesting! I mean, that's a plot that can go a million different ways, haha. It's true - and that's what I meant by traditional, heh. At the same time, it's a lot of fun, and definitely avoids the cliches (and puts some nice new twists in). It's not, sy, as beautiful as a Kay novel, but it's a wonderful read.